Drug trafficking and related violence is on the rise throughout the Caribbean at a time that the region is being heavily influenced by organized Latin American criminal groups. 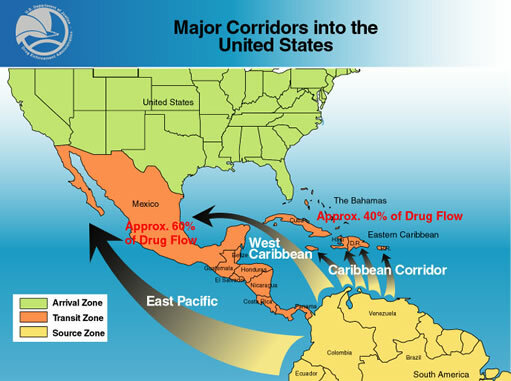 U.S./Mexico border controls have been profoundly tightened, resulting in a growing spillover of drugs into the wider Caribbean. The Caribbean’s natural landscapes and diffuse geographical locations make it appealing for drug traffickers who take advantage of such terrain that features long often uncontrolled coastlines and mountainous interiors for the growth and transportation of narcotics. The role of the U.S. has increased with the creation of the Caribbean Basin Security Initiative, targeted on helping to combat the growing menace of the drug trafficking phenomenon. Drug traffickers target vulnerable CARICOM islands such as Haiti to earn big profits by corrupting high officials. The 1970s marked the dawning of the drug trafficking phenomenon in the Caribbean. Since then, the tentacles of this multibillion-dollar illegal industry has plagued the West Indian islands with expanding drug cartel ramifications from Central and South America which continue to make use of the islands as a channel to deliver supplies to high-demand markets in the United States and Europe. Drug cartels use the Caribbean as a mode of transit, mainly because of its geographic layout. The cartographic projection of the Caribbean islands provides an advantage to drug cartels which make good use of its long coastlines to transport narcotics by means of fishing boats, speedboats, freighter shipments, yachts, and other modes of small commercial, as well as private sea transportation conveyances, along with light aircraft. For instance, the Bahamas is a favored transit point for Jamaican marijuana and South American cocaine cultivated and processed specifically for sale in the United States. Due to the far-flung Caribbean archipelago that contains over 700 islands spread across some 15,000 square miles, only thirty or forty of which are inhabited, thus making it difficult to regulate and detect such illegal activities taking place in such waters. In addition, “small commercial and private conveyances along short-distance maritime and aerial routes” also contribute to what has become a security dilemma. Mexico is infamous for its out-of-control gang violence that escalated from 2006 onward, when President Felipe Calderón began putting increased security pressure on drug trafficking organizations, as well as began to militarize the anti-drug war. In the 1980s and early 1990s, most drugs were trafficked into the U.S. from the Caribbean to South Florida. Currently, however, Mexico is the primary supplier of methamphetamine to the U.S, and is responsible for 95 percent of all cocaine entering the country. With the current tightening of the Mexican/U.S. borders, drug traffickers once again have returned to the Caribbean to transport their narcotics. Due to this increased trafficking in the region, alliances and hostilities also have developed between Central and South American criminal groups and their Caribbean counterparts. As a result, drug and gang violence has been exacerbated along with other associated malignant socioeconomic indicators throughout the Caribbean Community (CARICOM), as part of the spill over from the rest of Latin America. Along with the U.S.’ present tightening of its border with Mexico, there seems to be a significant shift in Washington’s focus on international security issues towards the Caribbean, with the creation of the Caribbean-U.S. Security Cooperation Dialogue. This annual event was established in 2010, to deal specifically with drug- related issues. In accordance to a news report, the U.S. Senate Committee on Foreign Relations was charged that the new subcommittee responsible for creating the Caribbean Basin Security Initiative (CBSI) to control and reduce drug trafficking and related violence within the region, which Senator Robert Menendez (D-NJ), would oversee the hearing. The CBSI has now decided to expand its focus to provide job training for youth and to help end corruption throughout the CARICOM region. U.S. Attorney General Eric Holder, who attended the Caribbean-U.S. Security Cooperation Dialogue held this November, seems to be supporting an open line of discussions with CARICOM on this matter. In fact, Holder spoke to members of the Judiciary Committee in December. In his testimony in that forum, he asserted that drug trading in the Caribbean “is a national security issue that we must face.” The U.S. must be aware of the fact that drug trafficking and related violence is a global problem and necessitates a global solution. Therefore, Latin America should also be invited to talks, as most Caribbean drug trafficking is a result of Latin American gangs using the region as a means of convergence of narcotics and marketed into the U.S. and Europe. This seems to be the case particularly regarding Puerto Rico, as frequent daily flights and being legally part of the U.S., make it easier for drug traffickers to smuggle their illegal cargo into North America. Presently, there is a lot of speculation about Puerto Rico becoming a narco-state with the increase in the illicit flow of drugs. Officials have noted that “75 percent of the [year’s] murders are drug-related.” According to a report by CBS news, “Drug smuggling is as much a part of Puerto Rico as palm trees and sand – American sand.” The main reason for this is that “For drug traffickers…once they get to Puerto Rico, no more customs checkpoints on the way to the mainland.” This is also the case for other U.S. Caribbean territories such as the U.S. Virgin Islands, which needs to be examined by U.S. authorities. Greater emphasis, therefore, needs to be made in when it comes to U.S.’ tactics to combat drug trafficking in their Caribbean territories – Puerto Rico and the U.S. Virgin Islands come to mind since “domestic commercial cargo shipments between these U.S. territories and the continental U.S. ordinarily are not subject to US Customs inspection”. Additionally, these U.S. territories, which are often less rigorously controlled and monitored by officials, become popular ocean drop-off points for Latin American cocaine shipment that have been previously airdropped on other eastern Caribbean islands such as St Martin and St Kitts. With the tightening of U.S./Mexico borders, vulnerable islands within the Caribbean have become even more susceptible to the lure of drug trafficking. Haiti is of particular interest to drug traffickers, as the island’s population has become more prone to participate in this illegal narcotic trade for a number of reasons, such as: poverty and corruption, economic and political instability, as well as an unsafe environment and a profaned ceiling on the availability of jobs –all of which has been worsened by the aftermath of the devastating January 2010 earthquake. Even before the earthquake, Haiti was the unlucky member of CARICOM, experiencing long periods of poverty and corruption. Of course Haiti is the poorest country in the Western Hemisphere and arguably, the most corrupt. Since the earthquake, poverty has been exacerbated, resulting in many Haitians turning towards drug dealing and trafficking in order to gain a fast injection of income. Furthermore, many Haitians have also started consuming drugs in order to ease the daily challenges of gathering adequate water, food and shelter for their survival. This has created an alarming number of addicts without access to treatment facilities, as there are presently no NGO- or government-sponsored rehabilitation programs or treatment centers available to the public within the country. The earthquake also has amplified the breath of corruption on the island, which amply was already present even before the disaster. In 2009 and 2010, a number of Haitian National Police (HNP) officers were arrested for conspiring with drug traffickers and other criminal organizations in gang-related activities. For instance, in an extensively publicized event reported in September 2010, “the Director of the Central Judicial Police, which oversees all HNP investigative units, announced the arrest of seven officers – most of them traffic police from the Brigade d’Intervention Motorisée (BIM) – accused of aiding drug traffickers and kidnappers.” Haitian officers described the seizures as part of a widespread cleanup within the local police force. Despite Herculean efforts, Haiti still struggles with drug traffickers whose presence has increased significantly after the earthquake. Since a large portion of the country’s infrastructure was damaged, the HNP has been left with additional difficulties to combat drug trafficking. Although Haiti is not a major supplier of drug and products, (only marijuana is grown in certain parts of the island) it is an ideal transit zone in which aircraft from Latin American countries perform drop-offs on a profusion of clandestine, unmonitored runways. Haiti’s topology also features long coastlines, which are woefully inadequate when it comes to the proper number of coast guard stations, and a mountainous interior that is perfect for accommodating drug trafficking routes as police officers are unable to chart the functionality of drug routes in such a geologically intricate area. Jamaica has experienced similar social and economic instabilities. The largest English-speaking island in the Caribbean, Jamaica is both the largest supplier and most prominent consumer of marijuana in the Caribbean. This is due in part to its thriving Rastafarian culture, in which its followers historically have “viewed marijuana as a medicine, intoxicant, and a religious sacrament.” Many drug traffickers and farmers continue to cultivate the plant in the northeastern part of the island, known as the Blue Mountains. This affords an ideal location for the drug’s cultivation, as the layout of the mountainside, valleys and natural ridges make the production of marijuana difficult to monitor. Traditionally, farmers have been able to conceal their production of marijuana plants amidst banana and coconut trees. In addition, many drug traffickers have become both respected as well as feared figures within Jamaican society, such as the infamous drug lord Christopher “Dudus” Coke, one of the most dangerous criminals in the Caribbean and the United States. Drug lords such as Dudus have been able to win the loyalty of the local community by providing “employment, education, medical and food supplies” for their neighbors, when the government was unable to do so. Island governments in the Caribbean, therefore, need to focus on the felt needs of the population in order to allocate adequate funds to social and economic development efforts so that locals do not turn to drug traffickers for such support. But, this is far more easily said than done. Drug trafficking seems to be on the rise within the Caribbean, particularly in Haiti, Jamaica and Puerto Rico. Persistent issues such as poverty, corruption, and political and economic instability recurrent plague these small island-nations. The limited development funding available within these chronically under-financed islands remains an important challenge. Many of them, such as Barbados, rely on tourism for their survival, and with the current relatively unfavorable status of the current world economy, tourists are less likely to be engaging in discretionary traveling around the globe. This has had a spiraling effect on the economic and social stability of islands, where, for instance, many agriculturalists who own small parcels of land or local businesses in St. Vincent and the Grenadines, now are found turning to growing marijuana for much-needed supplementing income. Furthermore, numerous Caribbean governments also lack the necessary funds needed to properly address security issues involved in combating drug trafficking, as some islands are still without a designated police force or coastguard service to properly monitor and ward off the danger posed by it. Moreover, these governments usually do not have adequate funds for the creation or maintenance of rehabilitation clinics. This is particularly alarming for women and children who are battling drug addictions as their needs are often far different from those presented by males, and frequently involve sexual trauma on top of their other addictions. Female drug users are dramatically increasing in Central America and in the Caribbean, where the International Narcotics Control Board’s (INCR) annual report has advised CARICOM governments “to ensure that, in efforts to combat drug abuse, adequate programmes are in place to ensure that special attention is given to female drug abusers”.On the bright side, however, islands such as Barbados and Trinidad and Tobago are engaged in preventative programs that target youth, who are particularly vulnerable to the shallow temptations of the drug world, through school lectures and training programs at all levels of education. In conclusion, the Caribbean drug dilemma exposes the severity of the danger that illicit drug trafficking presents to these small islands, as well as to the rest of the Western Hemisphere. This will continue to be a problem for local CARICOM governments unless they team up with much wealthier, as well as much more developed countries such as the U.S., which can help provide the much needed funds and other resources, such as training of local police officers and coast guard official, in order to professionally rebut this phenomenon.